Our hope is that you and your entire family can enjoy all the Columbia Valley has to offer. 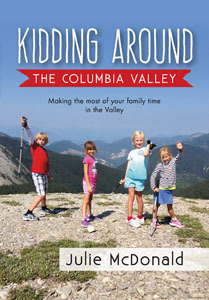 The book, Kidding Around the Columbia Valley provides activity options such as hiking, beaching, horse riding, paddling and biking that are suitable for the kids, the grandparents and everyone in between. The Columbia Valley is a wonderful place to gather as a family. This book will help you make the most of your gang’s time here and will assist in making decisions as to what adventures will provide the most positive experiences for your family. Kidding Around the Columbia Valley is a must-have in making the most of your time in the Valley.